Fez is the oldest of Morocco’s imperial cities and has served as the country’s capital no fewer than three times throughout its history. It was founded in 789 by the first sultan of the Idrisid dynasty, although many of its most famous landmarks date back to the 13th and 14th centuries, when the city reached the height of its influence during the rule of the Marinids. Today, it is one of the most authentic cities in Morocco, known around the world as a center for traditional artists and artisans. Fez is divided into three sections - the original old town, Fes el-Bali; Fes el-Jedid, built to accommodate the city’s expanding population in the 13th century; and the contemporary Ville Nouvelle quarter. Here are eight of the best things to do and see on your trip to this fascinating city. Fez’s old town, or medina, is a UNESCO World Heritage Site recognized as one of the best preserved historic towns of the Arab-Muslim world. It is also one of the world’s largest urban pedestrian zones, comprising a maze-like tapestry of narrow streets, bustling squares and souks lined with shops whose interiors resemble Aladdin’s cave. Stop to sample traditional foods, or to haggle with workshop owners for colorful pottery and intricate lamps. Keep an eye out for the donkey carts that ply the medina’s streets, and for architectural landmarks dotted in between the shops and alleyways. The best way to explore is to simply get lost. Arguably the city’s most famous building, Quaraouiyine Mosque is home to the University of Al-Quaraouiyine. Founded in 859, it is believed to be the world’s oldest continuously functioning university, and remains a vitally important center of Islamic learning. The mosque is also one of the largest centers of worship in Africa, and can accommodate up to 20,000 people during prayer time. The mosque and the university are out of bounds for non-Muslims, but the library was opened to the public in 2016. It is one of the oldest surviving libraries in the world, and includes amongst its tomes a 9th-century Qur’an. Catch a glimpse of the mosque’s courtyard through the main door. In Morocco, all educational buildings are known as medersas, and Medersa al-Attarine is one of the finest in Fez. Commissioned by Marinid sultan Abu Said and completed in 1325, it was originally intended to house students from nearby Quaraouiyine Mosque. Today, it is one of the city’s most impressive examples of Maranid architecture, with the courtyard in particular a masterpiece of intricate zellij tile work, carved stucco and ornate cedar wood carpentry. Elsewhere, fine marble columns and graceful Arabic calligraphy add to the building’s reputation as a must-see Fez attraction. Climb to the roof for beautiful views of Quaraouiyine Mosque’s green-tiled roof. Built by another Marinid sultan, Bou Inan, between 1351 and 1357, Medersa Bou Inania initially served as a theological college. It is still used for religious purposes, and is the only religious building in Fez open to non-Muslims. After a dedicated restoration, the medersa is resplendent in its beauty. Expect to see breathtaking zellij mosaics, fantastic stucco-work and fine lattice screens carved from fragrant cedar wood. Medersa Bou Inania is unique in that it features a full mosque instead of the simplified prayer hall of most medersas. Although the mosque itself is not open to the public, you can admire its beautiful minaret from any of the medina’s rooftops. 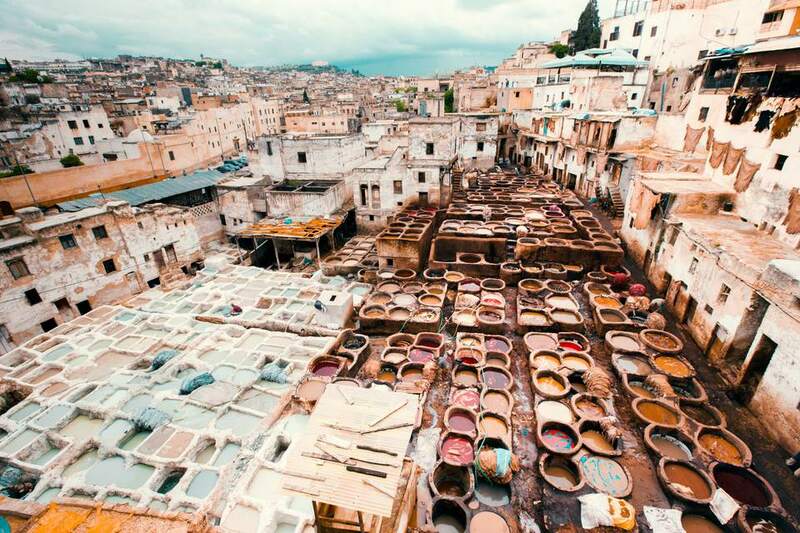 The oldest and largest of the traditional tanneries in Fez’s leather souk, Chaouwara Tannery dates back to medieval times. Here, skins are cured using archaic ingredients (including cow urine, quicklime and pigeon feces), and then laid out to dry in the sunshine. The smell of ammonia and raw hide can be overwhelming, but the sight of the multi-colored dyeing vats in the central courtyard is not to be missed. Enter the leather shops built into the surrounding walls for a bird’s-eye view of the action (best in the morning when the vats are still filled with dye), and to purchase supple leather goods made from the tannery’s hides. Built in 1582 as part of the walled fortifications that once surrounded the city, the Borj Nord fortress boasts an elevated vantage point and beautiful views of the city. It also houses a fascinating weapon museum, whose extensive collection provides an insight into Morocco’s military history. There are more than 5,000 weapons on display, spanning a range of time periods and including everything from jewel-encrusted daggers to the 12-ton canon used in the 16th-century Battle of the Three Kings. Some of the artifacts were donated personally to the museum by members of Moroccan royalty. Combine your visit with a tour of the nearby Maranid Tombs. Located just outside the medina walls, Jnan Sbil is one of the oldest and most beautiful gardens in Fez. Donated to the public by Sultan Moulay Hassan in the 19th century, it is now a haven of peace and tranquility and the perfect antidote to the sometimes claustrophobic chaos of the medina itself. Rub shoulders with visitors and locals alike whilst exploring the park’s meandering pathways or soaking up the sunshine by the grand central fountains. The air is fragrant with the scent of eucalyptus and citrus trees, and slender palms provide shade on hot days. There’s a large lake with plenty of birdlife, and a café for relaxed al fresco meals. In the newer section of the old town, Fes el-Jedid, the old Jewish Quarter (or mellah, as it’s known locally) comprises streets lined with large, crumbling house and vibrant marketplaces. Don’t miss the tranquil Jewish cemetery, or the 17th-century Ibn Danan Synagogue. The mellah dates back to the 14th century, when it was established as a refuge for the city’s Jews to protect them from Arab attack in recognition of their importance to the local economy. Initially a place of wealth and status, the Quarter eventually became little better than a European ghetto. Of the 250,000 Jews that once lived here, only a handful remain and have since relocated to the Ville Nouvelle area.